Tomorrow’s Songs Today, now available! Where did the word “filk” come from? When and where was the first filk convention, and who organized it? What was the original tune for “Mary O’Meara”? How did Off Centaur Publications rise and fall? How did the Pegasus Awards and the Filk Hall of Fame originate? Why do you see so many dandelion symbols associated with filk? 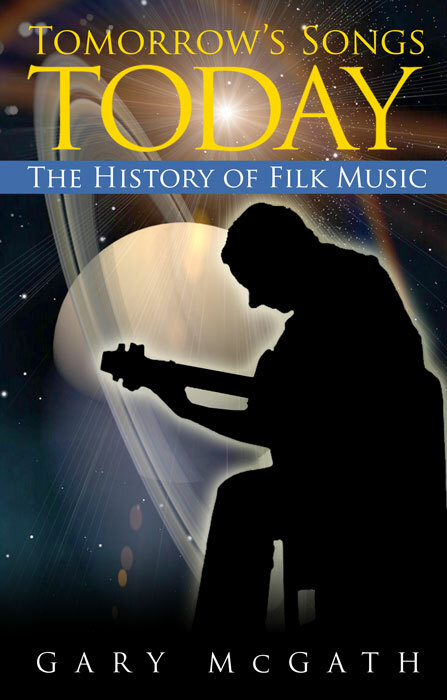 You’ll find the answers to these and many more questions — well, at least my answers, based on a lot of research — in Tomorrow’s Songs Today: The History of Filk Music, available for immediate download as a free e-book! It’s been a long effort, and I owe thanks to many, many people. Terri Wells’ editing and Matt Leger’s cover have made it a much better product than it would have been otherwise. Beyond that, I don’t want to fill this post with the huge list of acknowledgments, so just download the book and read them for yourself. The limited print edition will follow. It’s mostly to provide the promised rewards for my IndieGoGo supporters, but I’ll be making some copies available for sale. It’s rather expensive to produce a small run of a book and have it look good, so I have to apologize for the rather high price I’ll need to set. There will also be a few tote bags available. The release party will be at Boskone. 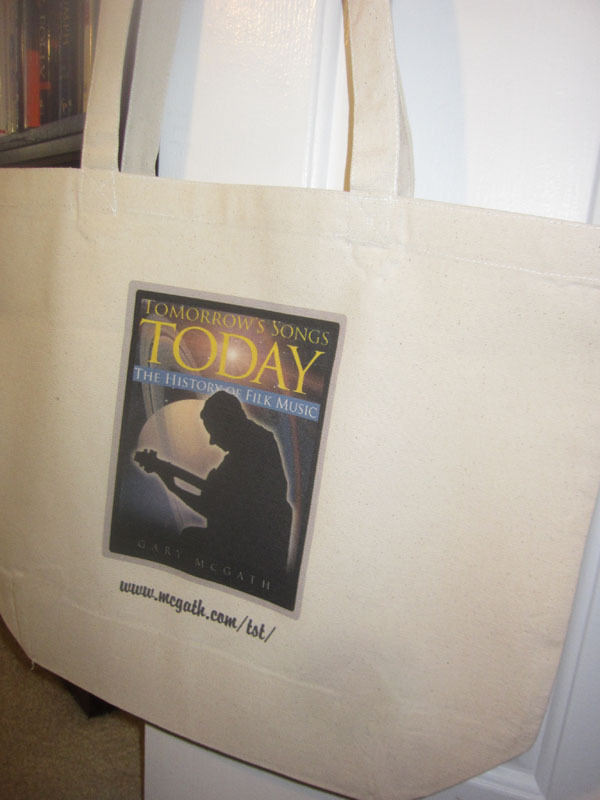 Tote bags for Tomorrow’s Songs Today are here! These were on my doorstep when I came back from a walk. Some of them will be going out soon as perks for people who supported my IndieGoGo campaign, a few will become gifts, I’ll keep one or two for myself, and I’ll be offering any that are left for sale at filksings or at Boskone. I’ve just come back from the Ohio Valley Filk Festival, where I conducted fifteen interviews for Tomorrow’s Songs Today . They included people from the US, Canada, and Germany, who’ve had a significant role in the history of filk. I’ve now got more information, more perspectives, and more good quotes to include in the book. Matt Leger has sent me a draft and a revision of the cover art. I really like it, and so did all the people I showed it to at OVFF. The final illustration will go on the tote bags and hard copy books, as well as the e-book. I’ll be making some extras of each available for sale as well as delivering the promised perks. Terri Wells has started going over my drafts and delivering some very useful recommendations. The project’s turning out to be a bit more work than I thought, just because people have been so enthusiastic about providing information, but it will be a better book for that. The book should be out before the end of January, which will let me deliver the perks on time. Sadly, with all the interviewing, I didn’t sing even one song at OVFF, but I had a lot of fun. Your support on IndieGoGo helped make the 1500 miles of driving possible. I just got a quote on spiral binding for Tomorrow’s Songs Today . It’s still not cheap, but it’s doable. All hard-copy books for supporters and other commitments will be spiral bound, with card stock covers front and back, and the front cover in color. I expect to have some additional copies for sale afterward. This is the signed and numbered edition; it’s possible that there will be a less expensive print version, but I can’t make any promises now. I’ll be talking with people at OVFF about filk history, to gather as much information as I can. If you’ll be there and would like to be interviewed, let me know. If you want to support the project, you have till the end of tomorrow (midnight Pacific time). You can still get your name listed as a supporter, as well as the tote bag, the printed book, or even your own custom songbook. Same URL as usual.